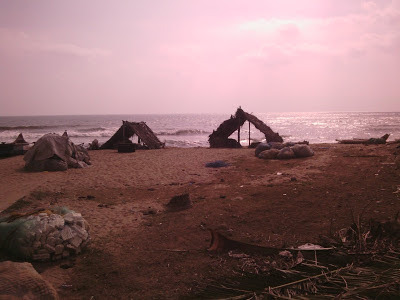 At regular intervals, small roads run perpendicular from the high way to reach the beach and we drove through one such lane to catch the beach waves and experience the mid-morning routine @ Pattipulam - a fishing hamlet which was badly hit during Tsunami. Some shots enroute Mahabalipuram and at Pattipulam( some clicks may lack focus and clarity since taken from a moving vehicle). Click to feel the place. This is Gopinath, a fisherman's son who was playing on the beach. A student of class 5. I liked the way he was balancing and told my son to click this shot. He was so happy and immediately he did the below acrobatic feat so that he could be captured again. He was excited to see his photo in the camera and we were happy to see his radiant face. Those little huts where the fishing nets and motors of the boats are kept made a beautiful sight. I liked the lighting in this pic. And the road leads to an ancient open air gallery of exquisite art and a port of Pallava times -Mahabalipuram - A UNESCO world heritage site which is my destination. Unknown places and routes like this make me feel that sometimes, the journey and not the destination is more interesting and fascinating and hence this series. Wow! Your wish was finally fulfilled. Did you buy anything from the roadside sculpture workshops? Good that one more thing got ticked off from your bucket list! And what a beautiful place... amazing captures!